George B. Bush on Wednesday nominated the neoconservative Paul D. Wolfowitz as the next president of the World Bank. But Wolfowitz is seen by many here as a unilateralist hawk and Europeans are outraged. Analysts across the continent spend Thursday venting on an appointment widely seen as "the absolutely wrong decision." The trans-Atlantic Spring didn't last long. It's been a mere three weeks since United States President George W. Bush swung through Europe distributing smiles and goodwill like a Fourth of July parade queen throwing candy to the crowds. He is now, from the perspective of many Europeans, throwing rotten eggs. The continent is not pleased. At issue is Bush's Wednesday nomination of Paul Wolfowitz to head up the World Bank. The news arrived here with the sobering effect of a cold shower, coming as it did after Bush's apparently short lived charm offensive to improve relations with Europe. Many in Europe view the current US Deputy Secretary of Defense as an aggressive hawk and as one of the primary movers and shakers behind America's highly unpopular decision to go to war in Iraq. He is also seen as a symbol of the Bush administration's aggressive go-it-alone nature that has soured trans-Atlantic relations during much of Bush's presidency. "The enthusiasm (over the nomination) in old Europe is not exactly overwhelming," said German Development Minister Heidemarie Wieczorek-Zeul -- a reference to US Secretary of Defense Donald Rumsfeld's infamous characterization of anti-Iraq war sentiment as coming from "Old Europe." The nomination comes on the heels of another unpopular Bush appointment, that of John R. Bolton as the US ambassador to the United Nations. Bolton has long been an outspoken critic of the UN -- an institution Europe would like to see strengthened -- and once said "if the UN secretary building in New York lost 10 stories, it wouldn't make a bit of difference." Rumors of a possible Wolfie (as he is called by Bush) nomination have been circulating for quite some time and his name was even circulated among the 23-member World Bank board several weeks ago. But as recently as March 3, it appeared that he was out of the running and current World Bank head James Wolfensohn even went on record as saying that Wolfowitz, 61, was no longer a candidate. 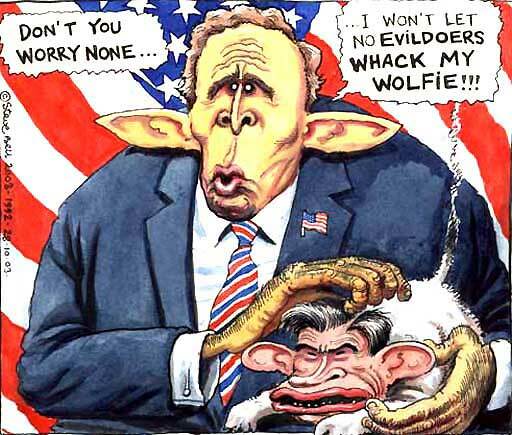 Wolfowitz is seen by Europeans as one of the primary architects behind the unpopular US invasion of Iraq. Still, because of the gentlemen's agreement between Europe and the United States whereby Europe chooses the head of the International Monetary Fund and the US picks the World Bank boss, analysts had spent recent weeks pondering who else Bush might put forward. The informal agreement, combined with the fact that the US has the most say in the World Bank due to its ownership of more bank shares than any other nation, makes the eventual approval of the US nomination a forgone conclusion. The return to a Wolfowitz candidacy has been greeted with dismay. "This is a truly terrifying appointment," said Peter Hardstaff, head of policy for the London-based World Development Movement, an organization committed to development in the Third World. "Here we've got a man who has a track record of pursuing US military interventionism and US business interests. It's shocking that such a person is perceived to be the best person for the job." Barbara Unmuessig from the Heinrich-Boell Foundation, a think tank aligned with Germany's junior governing coalition partner the Green Party, agreed. "Wolfowitz's nomination is, in my view, a disastrous decision," she said. "He has never shown any concern for the Third World. He has a bilateral political understanding and not the multilateral viewpoint necessary to lead the World Bank." For all the shaking of heads on this side of the Atlantic, the negative reaction was not universal. Most European leaders have remained silent on the issue on Thursday with the offices of both French President Jacques Chirac and British Prime Minister Tony Blair saying they have "taken note of this candidacy." Conservatives in Germany have gone so far as to express support. The coordinator of security policy for the conservative think tank Konrad Adenauer Foundation, Karl-Heinz Kamp, even said that Wolfowitz's appointment could be seen as an olive branch extended to the Europeans. With the nomination of Wolfowitz, not many people in Europe are in the mood to kiss Bush this week. "Bush has removed a personality from the administration who was not exactly uncontroversial while at the same time remaining loyal to his principle of rewarding those who have been loyal to him," said Kamp. "The nomination is part of the President's new strategy of accommodating his allies. In addition to Wolfowitz, other controversial figures like Bolton and (Undersecretary for Defense Policy) Douglas Feith, have also left the administration." Some American observers have also interpreted the nomination of Wolfowitz as the equivalent of a White House spring cleaning and a move that gives newly appointed Secretary of State Condoleezza Rice the opportunity to put her stamp on US foreign policy. While Europeans are mostly skeptical of Wolfowitz because of his hawkish record, many are also concerned about what his term at the top of the World Bank food chain might bring. With recent signs that democracy may be gaining a foothold in the Middle East, Wolfowitz -- who has long been a staunch, neoconservative advocate for the American export of democracy -- is seen as being at the height of his power. What, exactly, that will mean for the future of the World Bank is a question many here are asking. It's unlikely Wolfowitz will handle the Washington-based global institution with kid gloves. He'll talk the talk, but will he walk the walk? "I am sure he'll come out with the right rhetoric," says Hardstaff. "But his track record would seem to suggest that the World Bank will be shaped to ensure that the US domestic and business interests will be served. We can probably expect to see more vociferous or more committed pursuit of so-called free-market liberalization and market deregulation which have, unfortunately, proven to be a disaster in Africa over the past 20 years." "European enthusiasm is not exactly overwhelming." From an environmental perspective, Wolfowitz is likewise seen as a poor choice. Daniel Mittler, a Berlin-based political advisor to Greenpeace International, fears that Wolfowitz, a "known oil man," will not prove to be the right leader to move the World Bank away from funding fossil fuel projects and toward renewable energies. Stating that the institution's policies can influence the entire energy sector, "The World Bank urgently needs to shift its funding into renewable energies and away from fossil fuels and Wolfowitz is probably the least-qualified person to organize this vital shift which is necessary if we are to avoid dangerous climate change." One final worry that many have centers around the reputation the World Bank might develop under a Wolfowitz leadership. Because he has little experience in the field of poverty reduction -- one of the core missions of the World Bank -- and because of Wolfowitz's reputation as a unilateralist and the deeply divisive role he played in the Iraq war, some feel that his appointment will mean that the bank will come to be seen as a political instrument of the United States. "He's inexperienced in development policy and poverty reduction -- the core issues of the World Bank," said Jochen Steinhilber, who works on development issues for Germany's center-left Friedrich Ebert Foundation. "The question we're asking is what qualifies him for this job at all?" "I think the unrestrained responses you've seen show that there is going to be major discord between Europe and the United States over this," he said.